Home Italy	I have fallen in love with Emilia Romagna, and so will you. I have fallen in love with Emilia Romagna, and so will you. 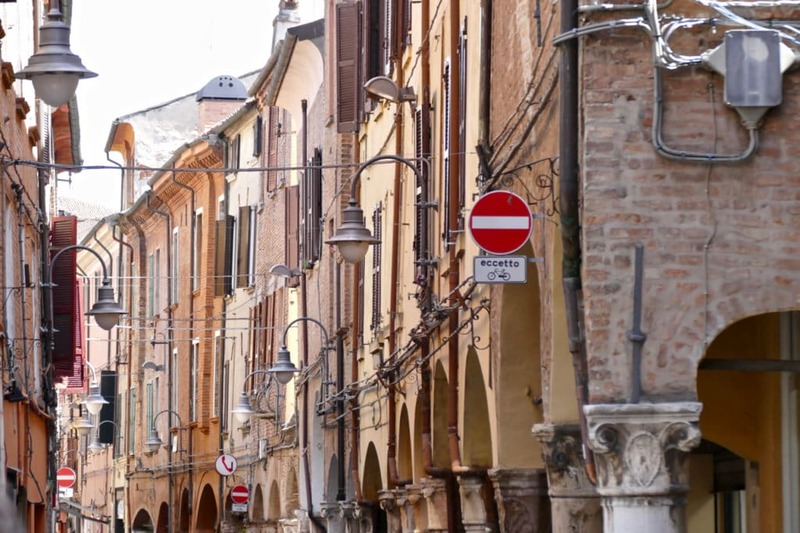 The Italian region of Emilia Romagna, with the city of Bologna at its center, was honestly speaking not high on my list of places I wanted to visit. How wrong I was. 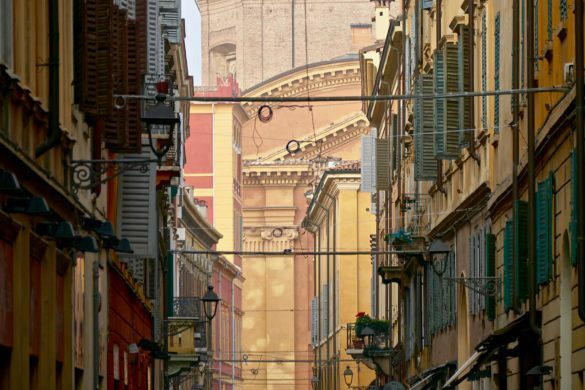 Bologna, one of my favorite Italian citiesVisiting the Emilia Romagna region in Italy is definitely not about the city of Bologna only. 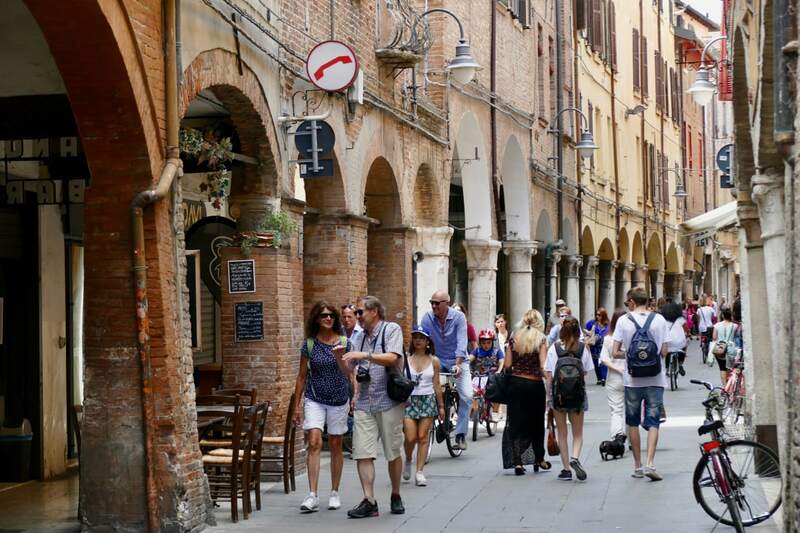 Bologna is the nucleus, the hub from where you can explore all the things you love about Italy: vineyards, castles, leaning towers, Italian food, hilltop villages, beaches, historic cities, etc. From Bologna it’s easy to reach a beautiful network of cities, villages and other special destinations. 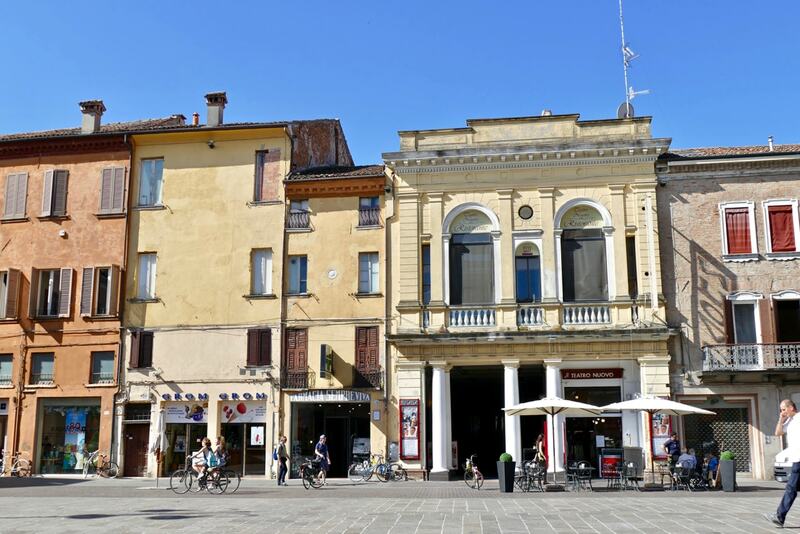 Really, if you want to spend time and effort in traveling outside the established tourist track of Rome, Venice and Florence, Emilia Romagna is a great destination. 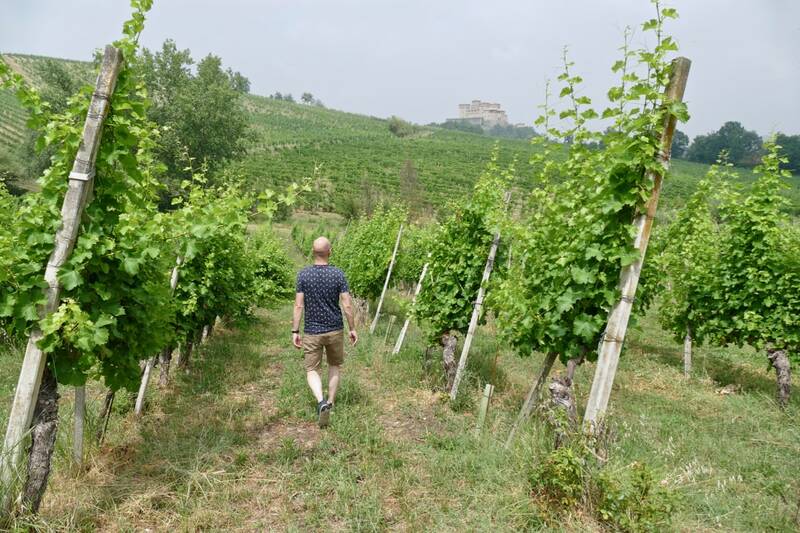 After spending two amazing days in Bologna I went out to see what else the Emilia Romagna region had to offer. 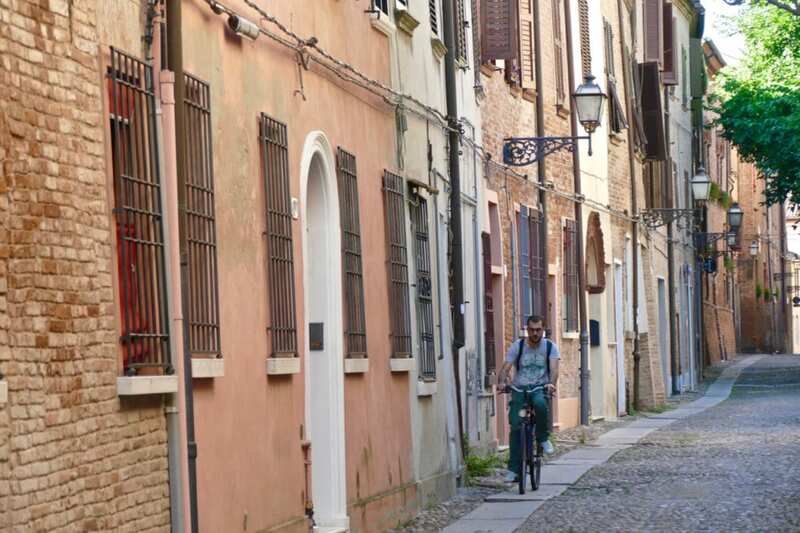 In this blog: the bicycle-friendly Renaissance city of Ferrara, two medieval castles and green vineyards. And….a surprise message at the end of this blog! 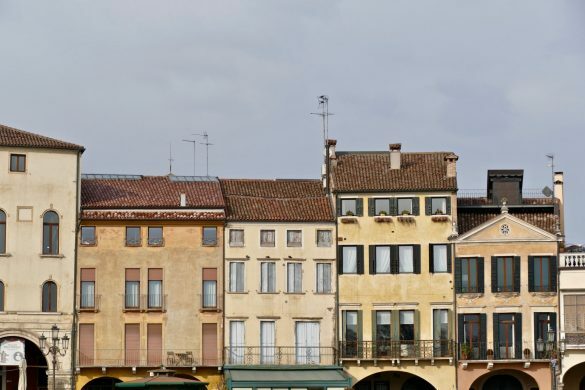 Half an hour by train from Bologna, the smaller city of Ferrara is a different experience compared to its big brother. I arrived early morning and left the train station (situated outside the massive medieval city walls) to walk towards the city center. The city’s ambience took me by surprise: arriving in the old town it was still very quiet with only distant voices of young children playing. Residents on bicycles were friendly greeting shop owners who were leaning against the doorpost. Looking left and right into back roads I noticed more people on bikes. I quickly learned that Ferrara is actually known as the most bike-friendly city in the region! I started to smile: a Dutchman in the City of Bikes, of course! Bologna was the vibrant regional hub where Ferrara for me was quickly becoming the laid-back alternative. 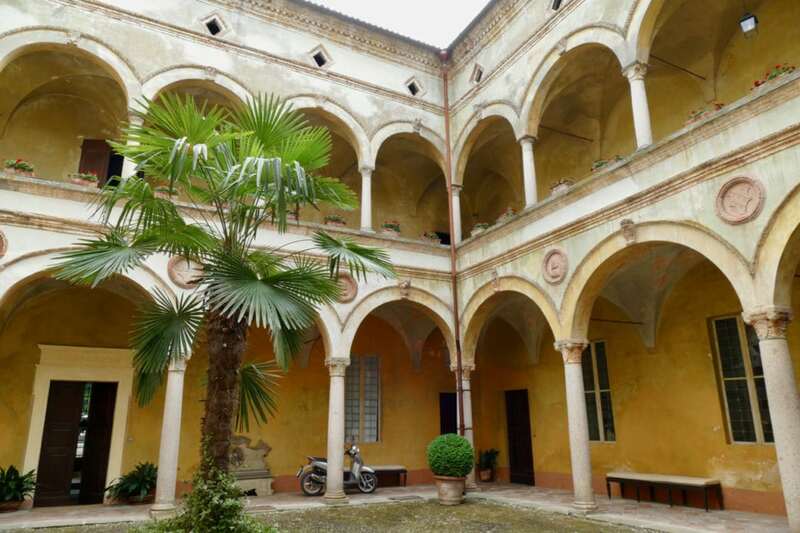 And I am not the only one who believes Ferrara is one of Italy’s hidden treasures! Read this beautiful travel story. 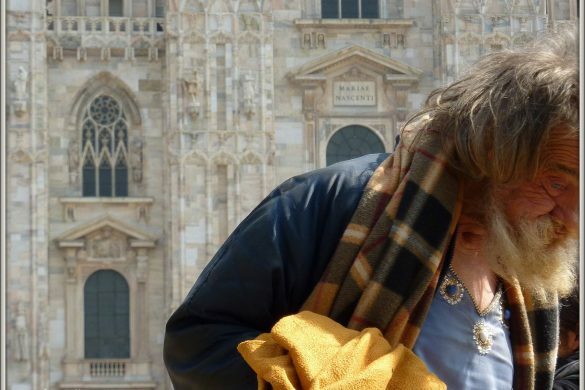 How much time you need in Ferrara? Well, you can easily spend a full day in the city itself. The Cathedral (built in 1135 with its gorgeous façade which unfortunately was being renovated during my visit) and the majestic Estense Castle (from 1385, see below) are the center of attention. They are both located near the grand boulevard that literally divides the medieval side in the south from the Renaissance part of town in the north. 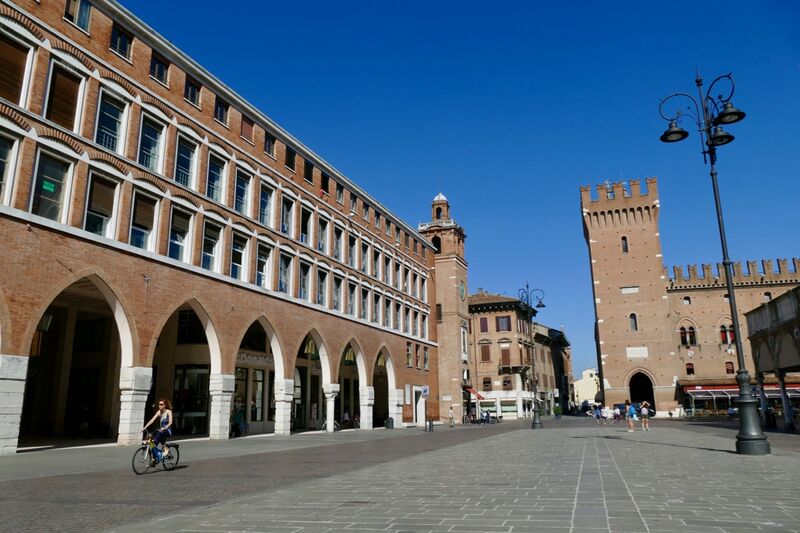 Ferrara is two cities in one as these parts are indeed very different from each other! 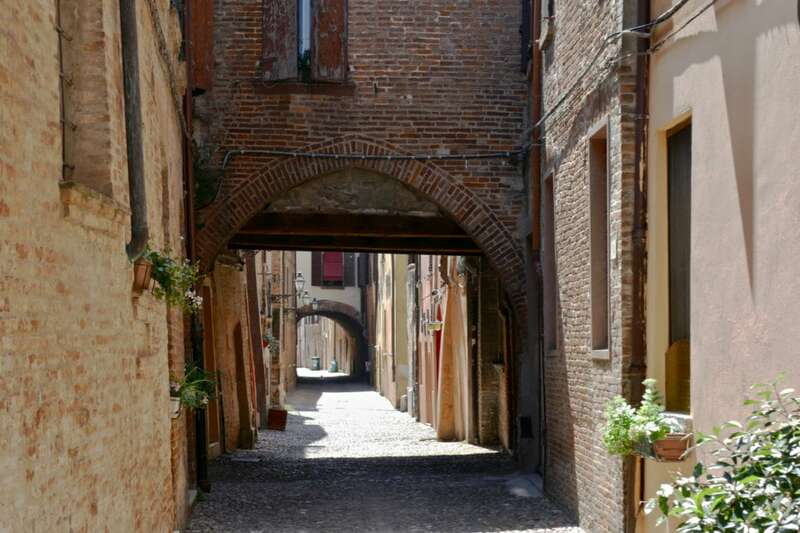 The older, medieval part in the south with its narrow and jumbled streets is the actual origin of Ferrara. 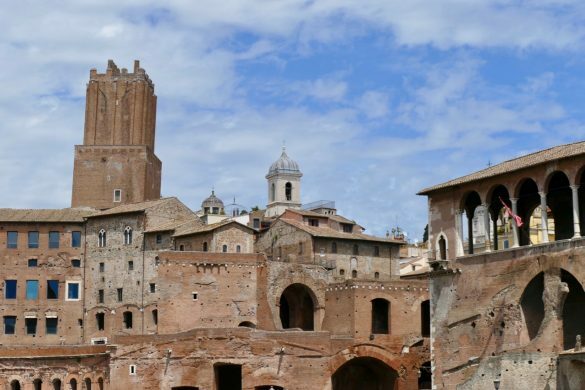 In the 14th century the city started to expand through the modern concept of urban planning. This resulted in a totally different look and feel compared to the original part of town. 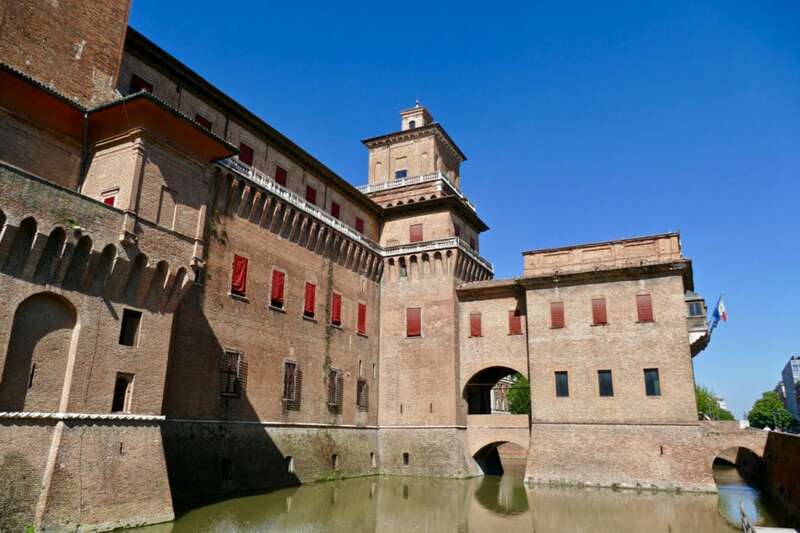 The spacious renaissance north of Ferrara is a total contrast from the medieval south. The Castello Estense (with its impressive moat) used to be at the edge of the original (medieval) town. But when the city expanded from south to north the castle slowly became the most prominent building right in the center of town. You can buy a ticket to enter the castle and climb all the way up into the tower (additional ticket required). 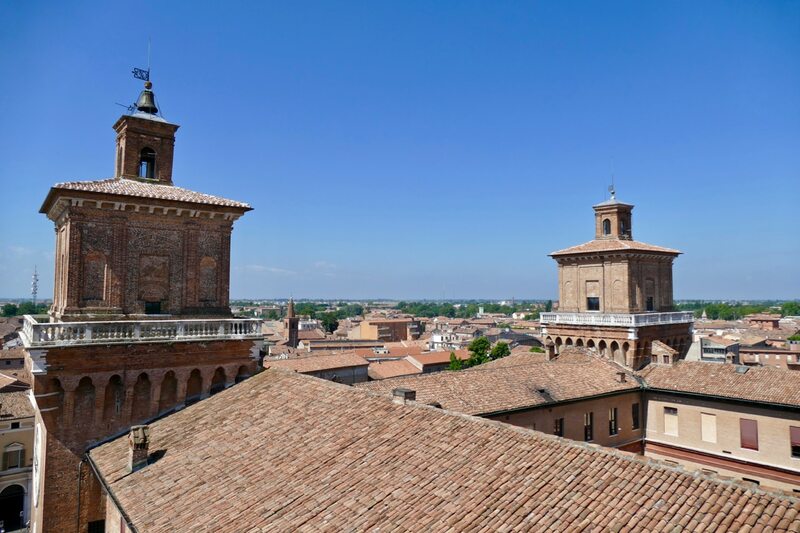 The south part is the old medieval town of Ferrara. Here you find lots of shops, restaurants and wine bars. This part did remind me of Bologna the most, although the atmosphere in Ferrara was again more unhurried. Must-see in Ferrara is Via delle Volte also known as Arch Street. 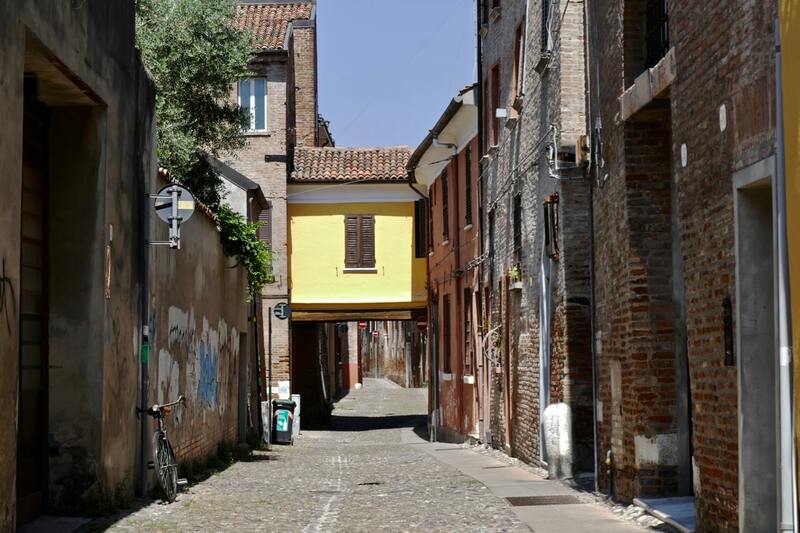 This charming street was the axis from which the old part of Ferrara developed between the 7th and 9th century. The street is made up of arches or covered passages that joined the houses of tradesmen with their warehouses on the banks of the river. This is medieval Ferrara on its best! 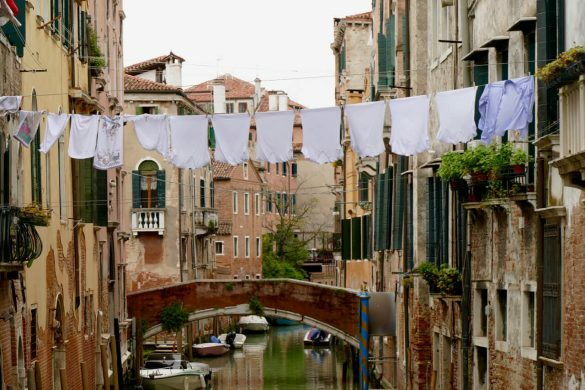 Photography tip: try to visit Via delle Volte twice, early morning and late afternoon. When the sun is out during the day, the contrast between light and dark might make it difficult to take balanced pictures. 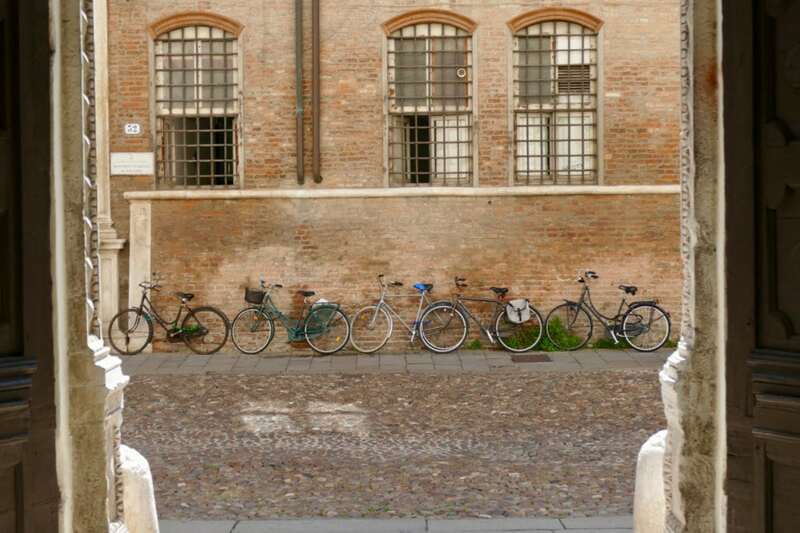 Ferrara is indeed the City of Bikes. There are many organized bike tours in and outside the city. Rent a bike and ride the ancient city walls. 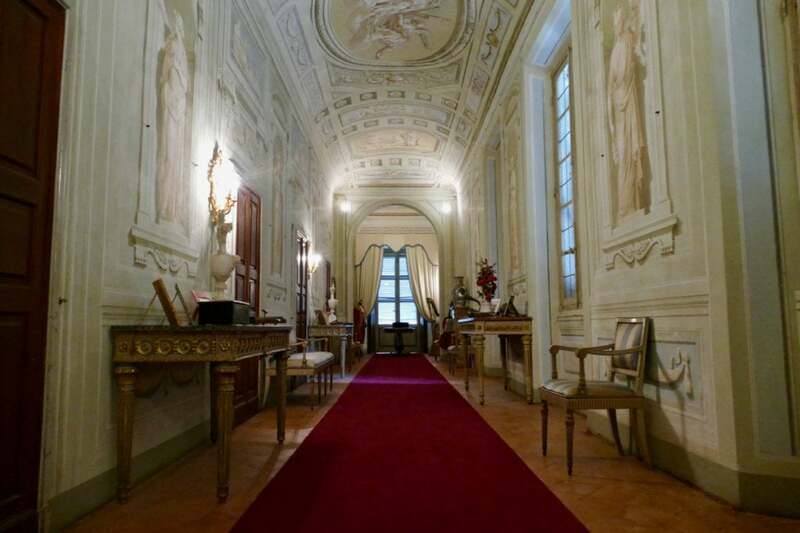 Discover the renaissance side of town with its palaces and grand houses. 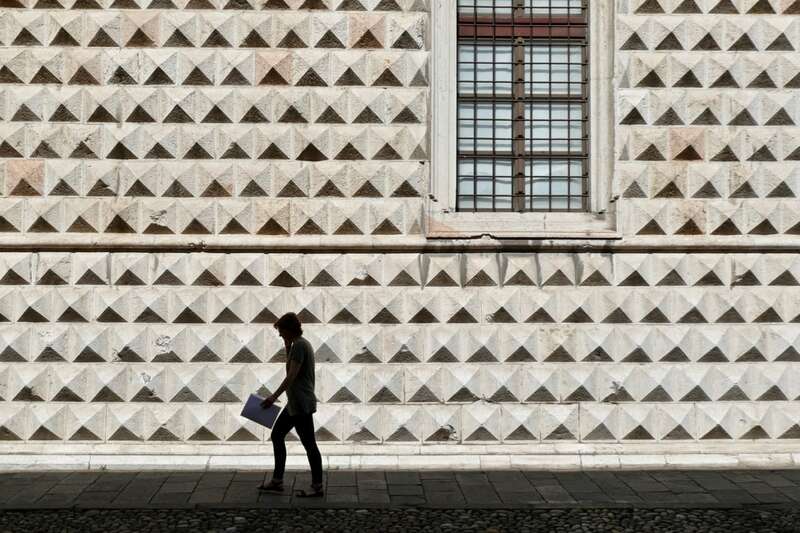 Pass by the magnificent Palazzo dei Diamanti (with its exterior of 8000 marble, pyramid-shaped stones) before you head out of the city (if you have the time!). The banks of the river Po offer great bicycle routes which are available at the Tourist Office inside the Castle Estense. Back to Bologna after a day in Ferrara I traveled east to the city of Parma. In Parma our guide Sara picked us up for a visit to Torrechiara castle. 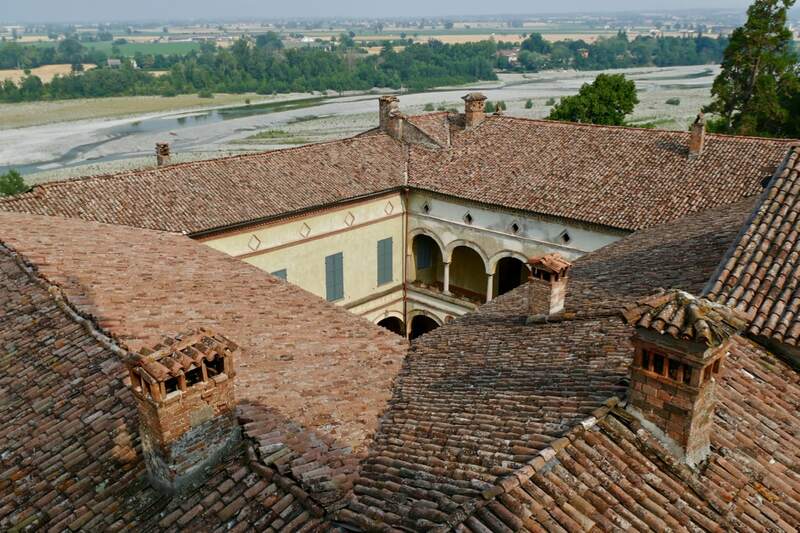 18km south of Parma, Torrechiara is one of the best-preserved fortifications in the region. 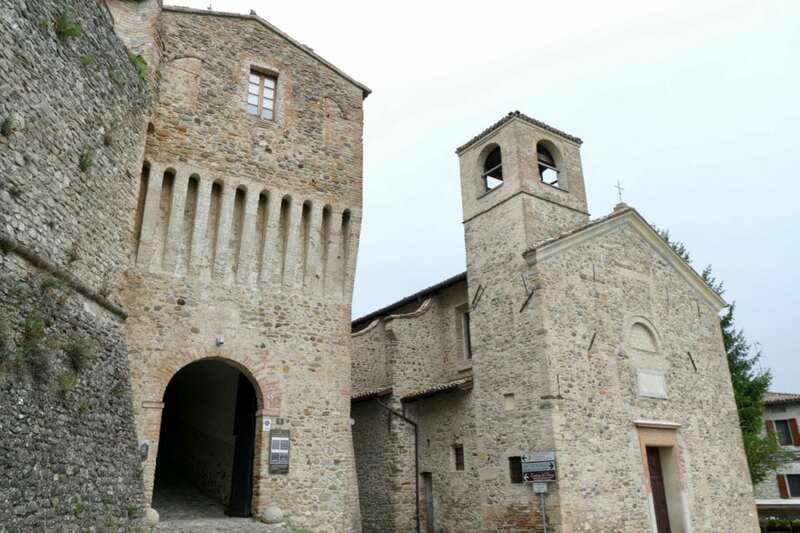 Built between 1448 and 1460, this was one of 14 castles near via Emilia, one of the main Roman trading routes. 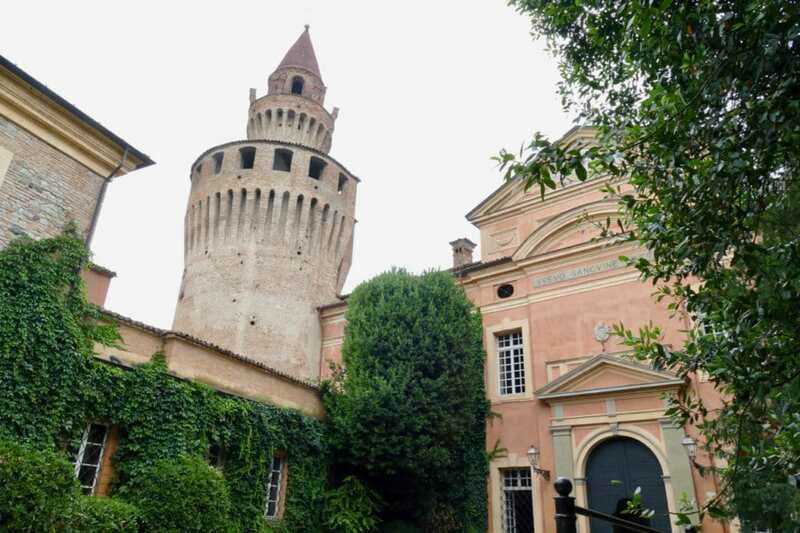 These castles turned into mini villages (Borgo) where people asked transit fees to passing tradesmen and took active part in trading activities. 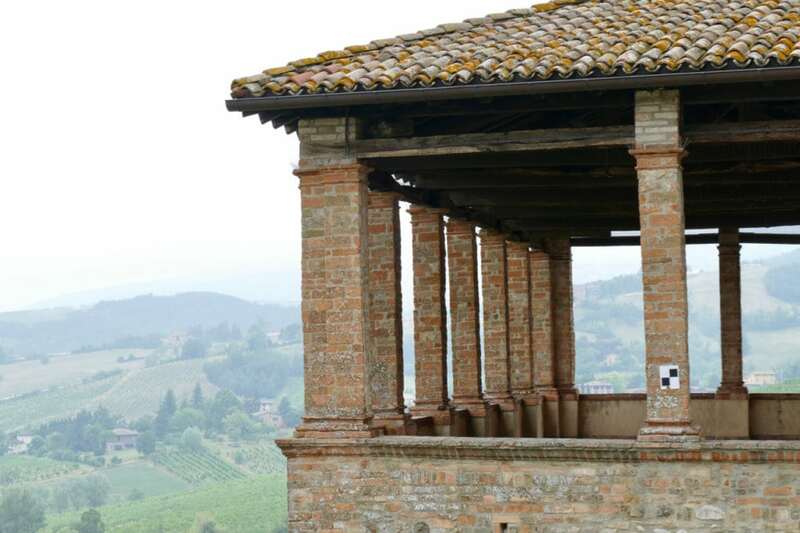 Situated high upon a hill to keep an eye on everything passing by, the views on the Parma valley are stunning! Besides the great valley views the interior with frescoes really struck me! 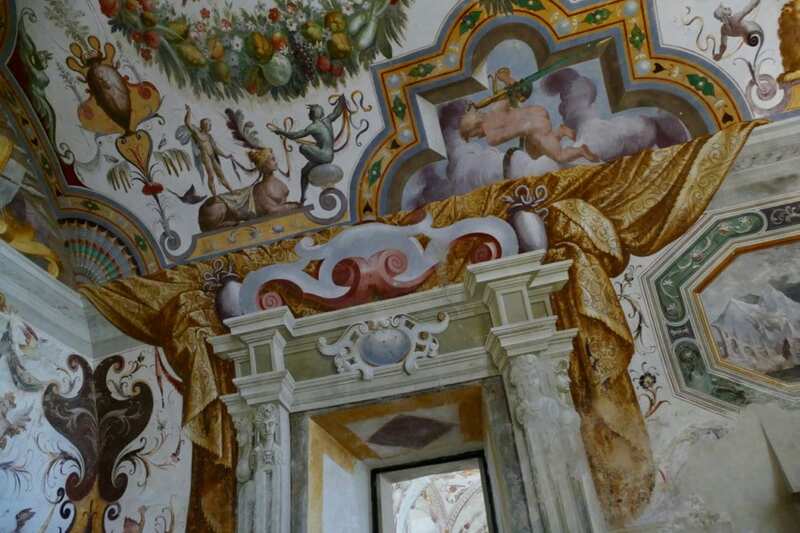 Our guide Sara showed us multiple frescoed rooms carrying the most amazing fresco art. Frescoes telling stories from the past or just visualizing the fantasy of its maker. Some of the ceilings were covered completely with stunning art and colors. The Parma area is famous for the production of Lambrusco Meastri wines. You will find only 10 producers of this prestigious wine and they are all growing their grapes on the typical red hills of Parma. 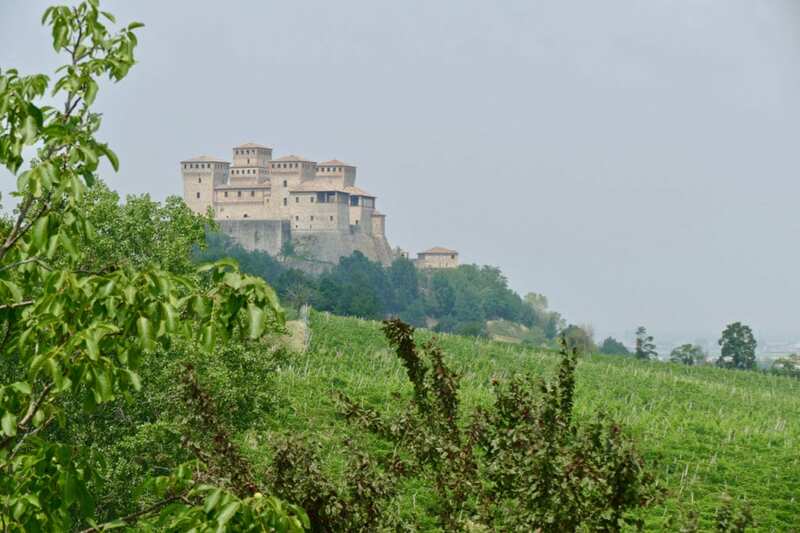 We had the pleasure of visiting the Lamoretti vineyard, with excellent views of the Torrechiara castle. If you are interested to have a tour or a winetasting session, check out possibilities at local vineyards. Lamoretti promised us that Parma wines will soon become very popular as the quality gets better and better by the year. 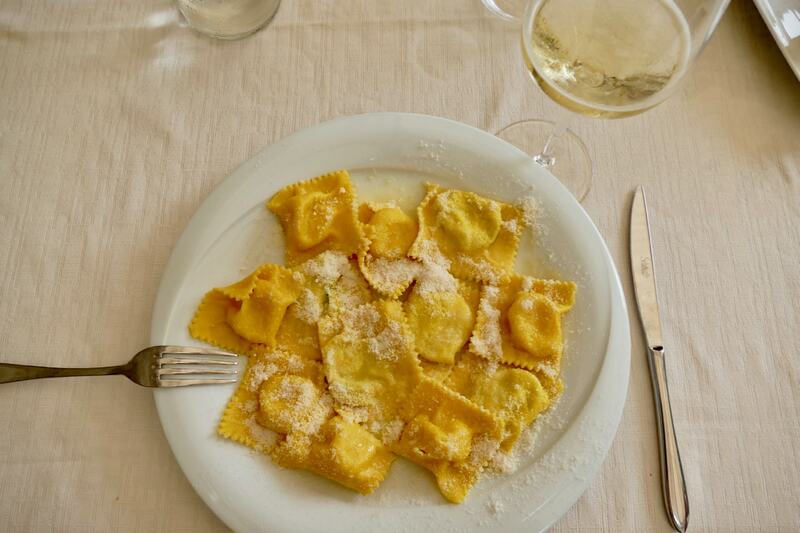 This quality was definitely proven during our lunch at the castle’s restaurant Taverna dell Castello: local tortelli with a glass of sparkling Lambrusco. Delicious, what a treat! Next stop: privately owned castle Rivalta near Piacenza. This castle was built in the 15th century and the Landi family have lived here for 8 generations. 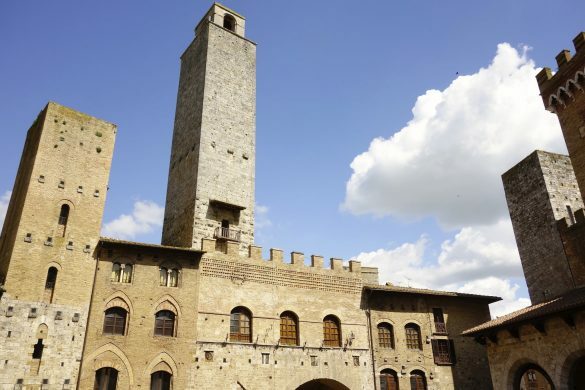 It is said that the characteristic tower of the castle was designed by Pietro Solari, the same architect who designed the Kremlin in Moscow. The castle offers regular guided tours. 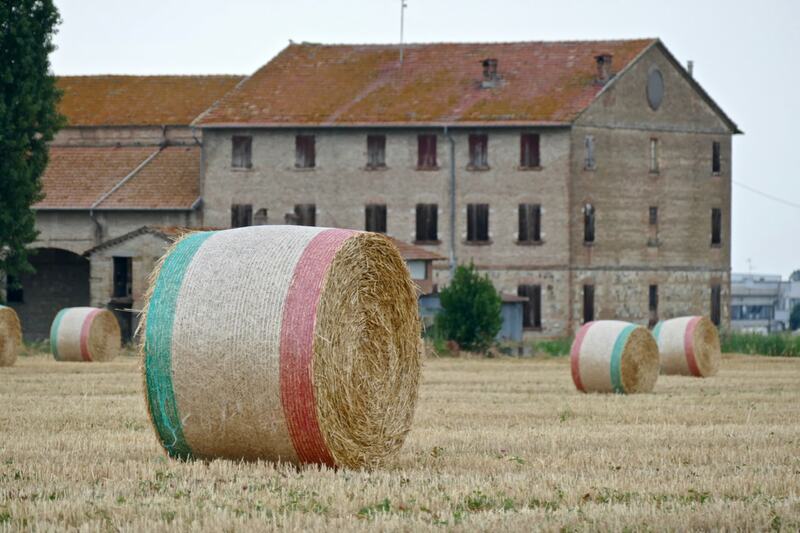 Rivalta is situated 20km south of Piacenza, in the east part of Emilia Romagna region. It’s an interesting stop when you are staying in the Piacenza area. You can even stay the night in the castle hotel! 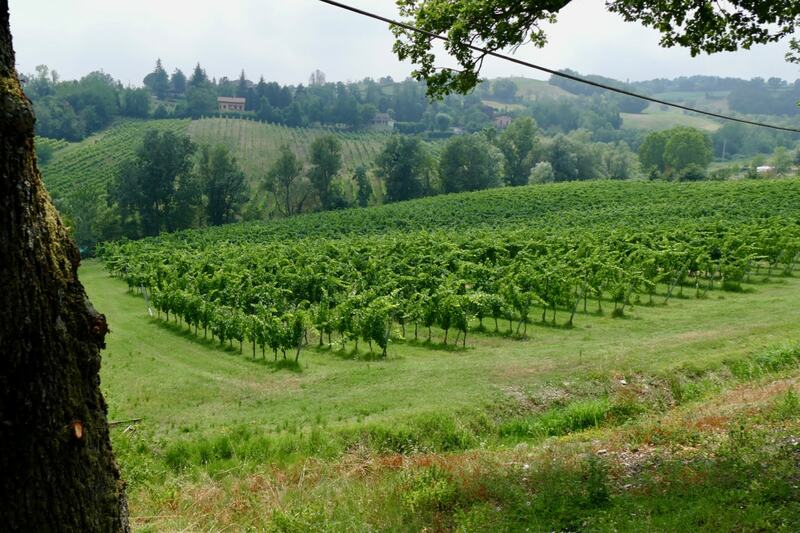 This has been just a tiny bit of what the Emilia Romagna region has to offer. Full of hill-top villages, castles, cities and special places this is an area where you can easily spend a week. Even more! 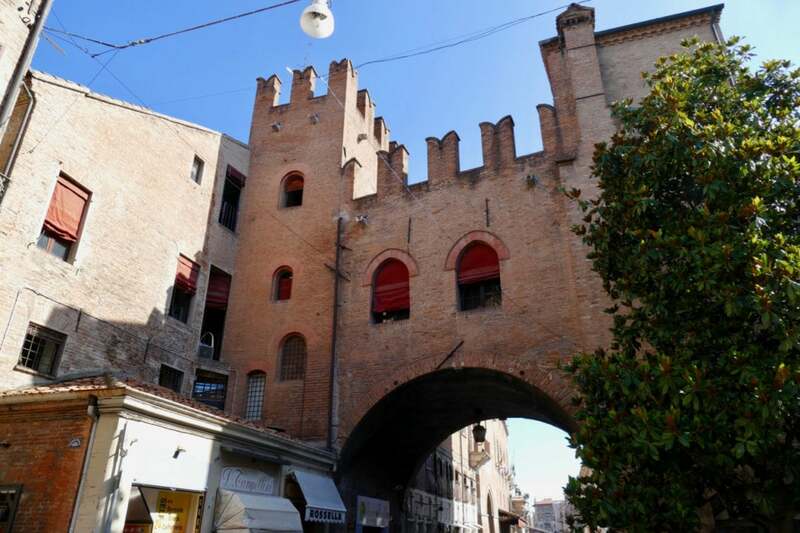 Bologna is a great base for your travels, being the most important hub in this part of Italy. Trains travel to all directions including Parma, Milan, Venice, Ravenna, Florence, Rimini, to name just a few. 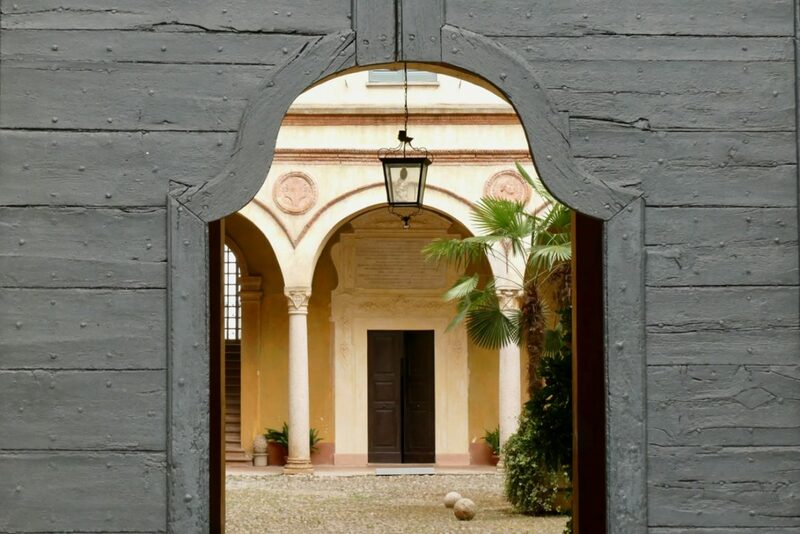 I would love to visit and show you more great places, both in and outside of the Bologna hub. Want to know a little secret? We’ll be back in October! More stories and travel tips about the Emilia Romagna region on this blog later this year. I’m excited already! Updat. 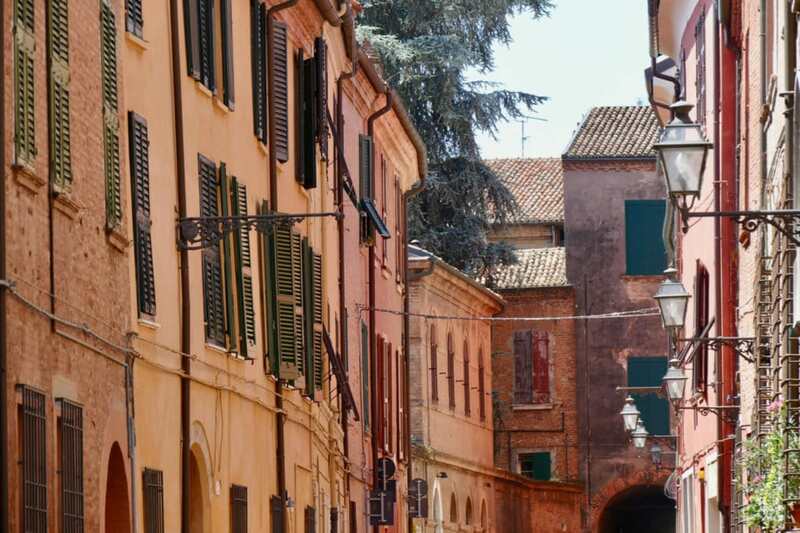 Meanwhile the following new stories about Emilia Romagna have been posted: Best of Bologna, Things to do and see in Modena, Brisighella hilltop village. For further information please visit Emilia Romagna Tourist Board who facilitated the #InEmiliaRomagna and #Blogville project. In cooperation with Bologna Welcome and iAmbassador/Blogville. 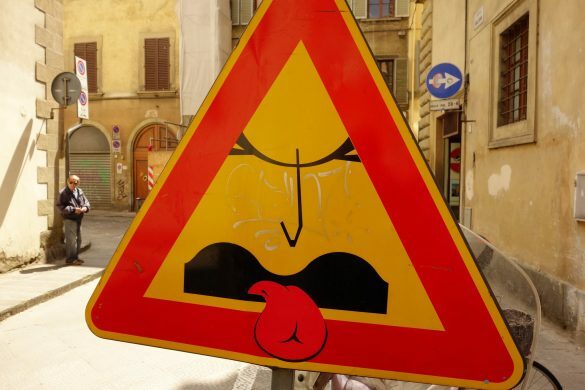 Street art in Florence: look at the traffic signs! 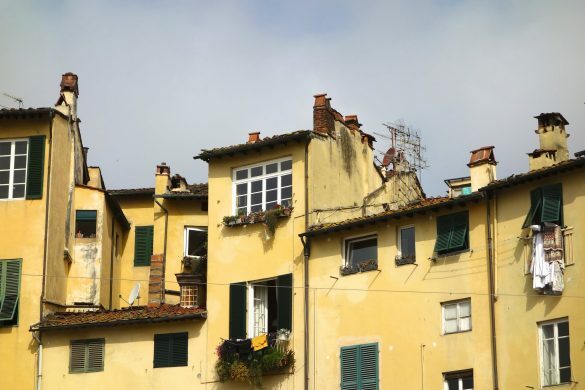 Immersion Travel in Tuscany: who would have thought about terracotta? 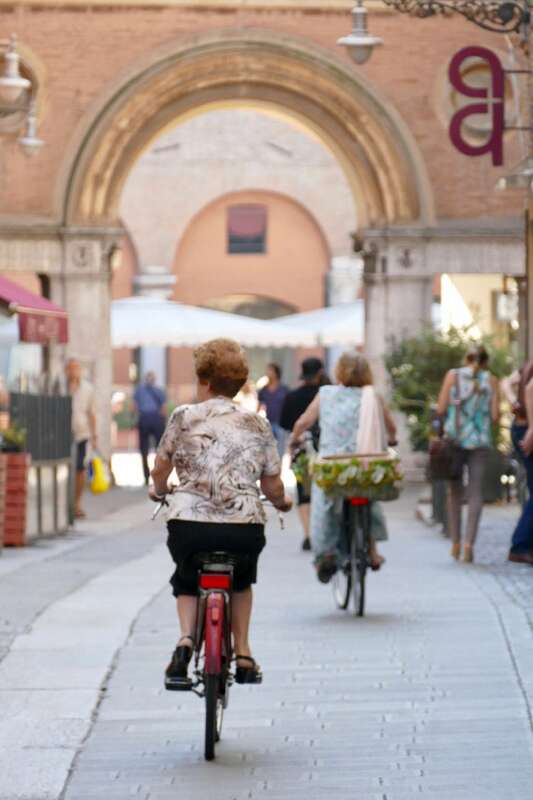 Emiel in Emilia Romagna, a cycle-loving Dutch in a cycle-friendly city of Ferrara! I used to know Bologna only for its leaning towers (and the bolognese sauce), and Parma for its Parmigiano cheese, and Piacenza for its football club (back in the days when it was still in Serie A). Little did I know that Emilia Romagna itself is in fact filled with beautiful castles, pretty medieval towns, and other interesting historical sites. Glad you showed the way, Emiel! And looking forward to more stories from your next trip to this part of Italy in October! Thanks Bama! The region is also known as Foodvalley and Motorvalley (because of the Ferrari and Ducati factories and museums in the area). I hope to visit the Enzo Ferrari museum in Modena in October. Next to some more pretty little villages and again Bologna (still need to climb that leaning tower!). Hey, I’m Emiel – the writer, photographer and creator behind Act of Traveling. Enjoy our travel stories and photos from around the world. Let’s go and find your next travel destination! Receive an email when new travel stories are published! @2016 - Act of Traveling. All Right Reserved. 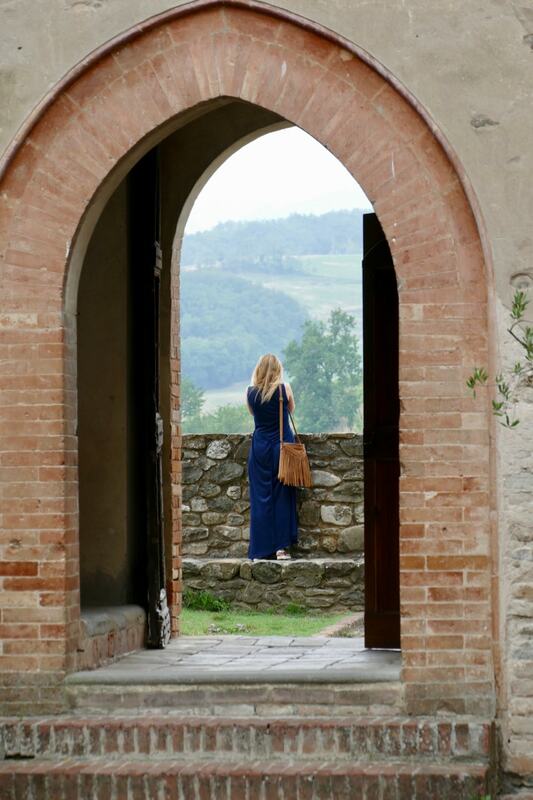 Home » Destinations » Europe » Italy » I have fallen in love with Emilia Romagna, and so will you.